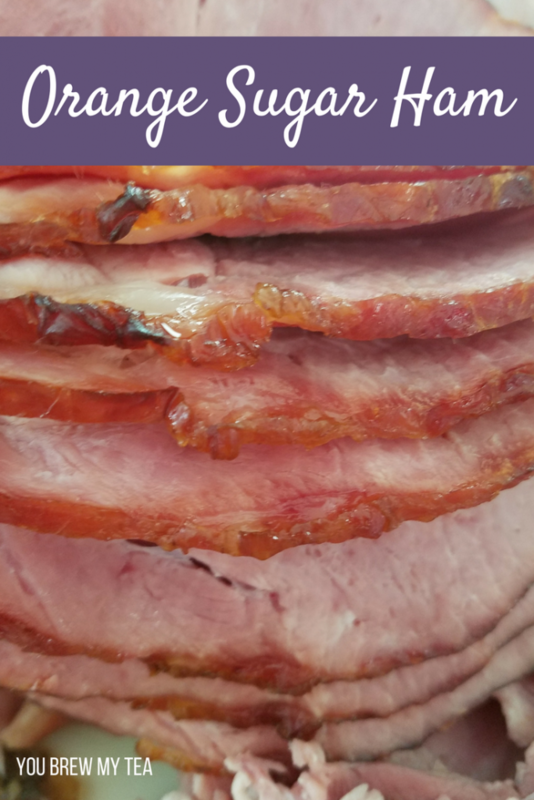 This Orange Sugar Spiral Ham Recipe is a great option for your holiday meal! While the recipe is for a large spiral ham, you can use this marinade on any ham or pork dish with great results. It only adds one extra SmartPoint per serving, so makes it a great option for satisfying your craving without going over your points for the day. 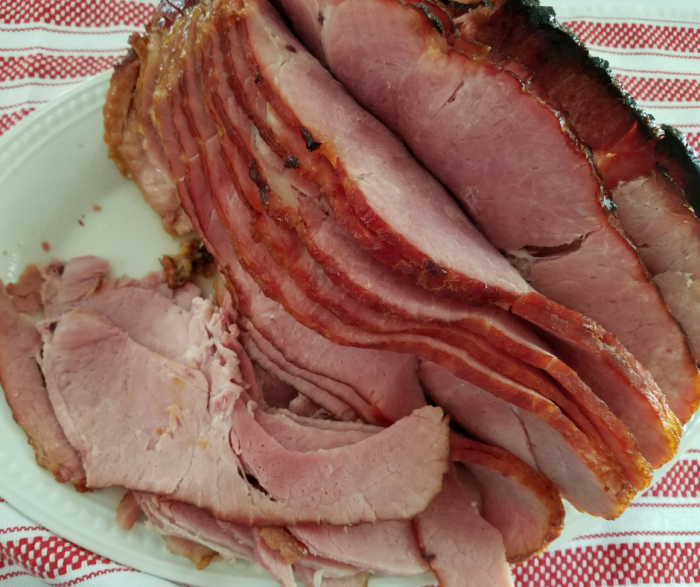 Everyone loves a ham at big holiday meals. It has always been one of those things our family had around Easter and Christmas. Since I am no longer eating meat, this isn’t something I will make, but I know this recipe is a great option for those that will. 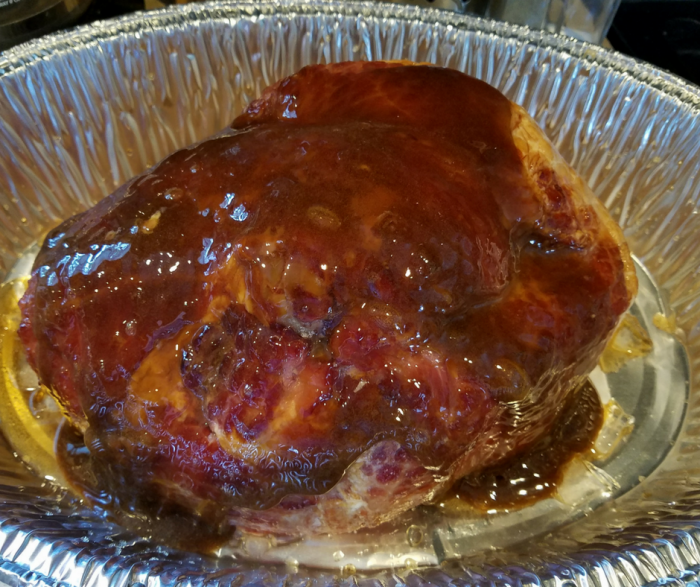 My friend made this for us last year and agreed to share her recipe here so I could share a tried and true option for a spiral ham recipe. Prepare a large roasting pan by lining with aluminum foil and placing ham in the center. You can also use a classic ceramic roasting pan with a lid. In a small bowl, mix together the brown sugar and orange juice and set aside. Pour mixture into the slits on spiral cut ham. Cover the ham with aluminum foil leaving loosely covered. Place ham in the oven and bake at 350 degrees for 2 hours. Remove from oven and baste with juices from ham and marinade. Place the orange slices onto and around the ham. Cover the ham again, and return to the oven for additional 1 1/2 hours. Total cook time 3 1/2 hours at 350 degrees. Prepare a large roasting pan by lining with aluminum foil and placing ham in the center. Remove from oven and baste with juices from ham and marinade. Place the orange slices onto and around the ham. Cover the ham again, and return to the oven for additional 1½ hours. Total cook time 3½ hours at 350 degrees. The points calculations on this spiral ham recipe are for a 3-ounce portion. Hams vary a lot in size, so I am not adding a specific number of servings since your ham may have more or less. If you want the most accurate points value, you’ll need to use a digital kitchen scale for weighing the meat before eating. 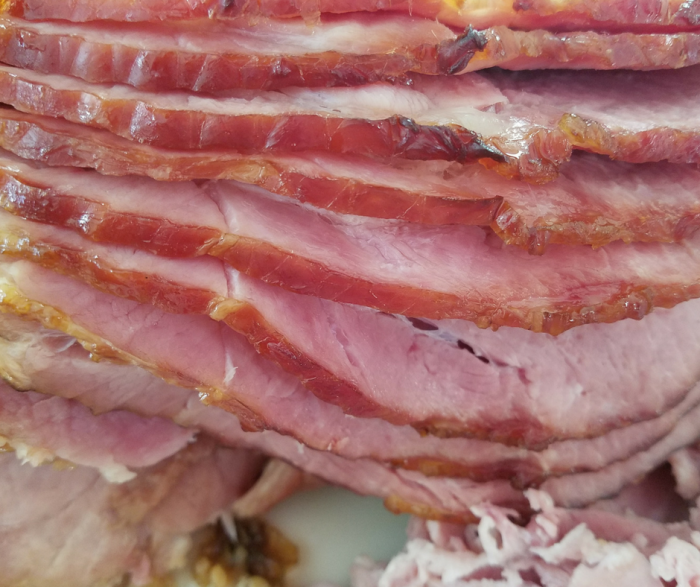 Serve this spiral ham recipe for your next big family meal or holiday event. The bright orange flavor compliments the natural sweetness of the pork, and this recipe is easy for even a novice cook to follow.